Quality cotton broadcloth fabric in skin colors for doll making. NOTE: this is WOVEN fabric and is not stretchy. Cloth doll makers have been asking for a woven fabric in skin tones. These are not exact matches for the knit doll skin, which is milled and dyed especially for us. We don't often re-name colors, but decided to go to the manufacturer's names, as each bolt comes in differently. ice peach ~ a shade darker than our peach. Kona brand 100% cotton broadcloth, 45" wide. NOTE: cotton broadcloth is NOT SUITABLE for waldorf dolls. This is a WOVEN fabric and does NOT stretch. Oeko-Tex standard 100 certified free from harmful substances, No. 0903011. 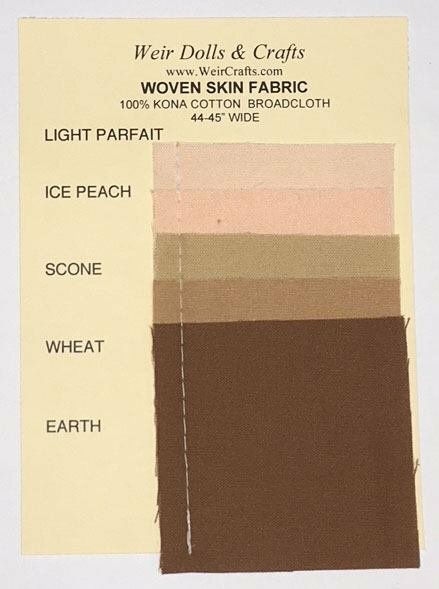 Color swatch card with 2x2" swatches of woven cotton doll skin colors. Scone (not shown in picture) also included.